Marshmallows. These little pieces of sweetness are so versatile. Drop a couple of them in your hot chocolate, flavor is enhanced. Layer graham crackers, chocolate chips and marshmallows in a pan, pop them in the oven for a bit. You have S’mores ready. 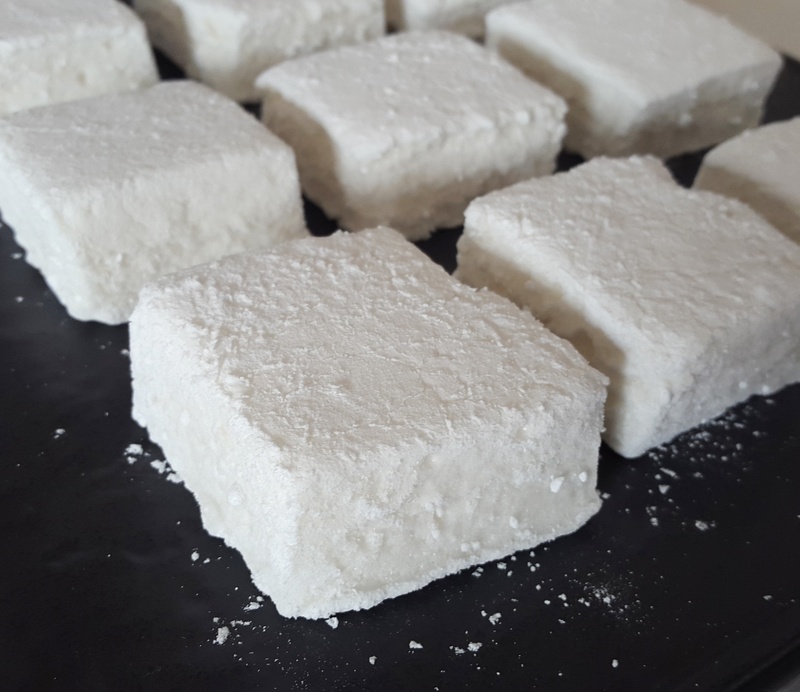 Melt the marshmallows in the microwave, you have Marshmallow fluff ready. And obviously eat them just as they are and this fluffy snow pieces are just plain delicious. In a small bowl, mix gelatin and half of of the cold water. Keep it aside for the gelatin to bloom, for about 5 minutes. Grease a 8 inch round/square pan, line it with plastic wrap. Lightly grease the wrap. Mix icing sugar and cornstarch in a bowl. This will be called the SC mix. Dust some of it on the pan. Heat the gelatin mixture in a microwave for about 30 seconds or more. Till the gelatin is melted and the mixture is hot but not boiling, so that the gelatin can activate. In a stand mixer, add the warm gelatin and half of the corn syrup. Start mixing on a low speed. In a saucepan, take the remaining half of the water and corn syrup, add caster sugar and tiny pinch of salt. On medium high heat let all the sugar melt. If you have a candy thermometer, bring the temperature to 120 Celsius. If you don’t have the candy thermometer bring it to a good rolling boil, the mixture should be thick and clear. When the mixture reaches 120 C. Slowly and carefully pour the sugar mixture into the gelatin mixture, while the mixer is still on. Increase the speed to medium and mix it for 5 minutes. Turn the speed up to high, mix for 10 – 15 minutes. Until stiff peaks like meringue are formed. Pour the mixture on to the pan. Level the mixture on top with a spatula. Dust a good amount of SC mix on top. Leave it out in room temperature for 24 hours. On a tray/plate dust the SC mix. Flip the marshmallow out and dust more SC mix on top. Take a knife and cut pieces. You can also just rub SC mix on the knife to avoid sticking. Take the individual pieces and coat with SC mix and store in an airtight container. Overtime due to humidity the marshmallows may become sticky. Coat them in SC mix before serving. Whipping the mixture will take any where around 15 – 20 minutes. If you have a stand mixer your workload is lessened quite a bit. If you have a hand mixer then you need someone to either pour the sugar mixture while you mix or vice versa. But continue whipping till almost stiff peaks. You have to use gelatin. Some of you may have dietary concerns regarding gelatin but substituting it may and may not give the same results. Sugar at 120 C will be at the soft ball stage. Which when you drop a drop of mixture in to cold water and remove it, it will turn into a soft ball. The SC mixture is very important and cannot be edited. Let the marshmallows rest at least for 24 hours before serving. Do not keep it in the refrigerator. You have to set it at room temperature. Do comment below if you liked/tried/query about the recipe.